A new report on climate change actions by Higher Education Institutions for sustainable development was presented on 14 October. 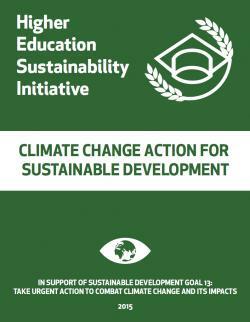 “Climate Change Action for Sustainable Development” was prepared by UN-DESA, through its Division for Sustainable Development, in collaboration with the partners of the Higher Education Sustainability Initiative. The report was presented on the occasion of the event “From Rio to Paris: Higher Education for Climate Change Action”, held on 14 October 2015 at UNESCO headquarters, organized by the partners of the HESI initiative in close collaboration with the Kedge Business School. The report was handed over to the French Secretary General of the Conference of the Parties to the UNFCCC (COP21) during the event. A two day Ministerial Meeting on Food Security and Climate Adaptation in Small Island Developing States (SIDS) took place in Milan from 14 to 15 October. The Meeting explored the implications of the S.A.M.O.A. Pathway, the action plan for the sustainable development of SIDS adopted in September 2014 in Samoa, as it relates to food security and nutrition and climate change adaptation, also in connection with the recently adopted Sustainable Development Goals. Partnerships will be essential for achieving the 2030 Agenda for Sustainable Development, including the sustainable development goals (SDGs), and the 1800 registrations on DESA’s ‘Partnerships for SDGs’ online platform by member states, international organizations, businesses, civil society and other stakeholders provide a strong basis for joint action. The Partnerships for SDGs platform is currently in a draft (beta) version, with a full version including additional functionalities to be launched in January 2016, responding to the needs of the users and to the requests of the High-level Political Forum on Sustainable Development. Views are now sought from all stakeholders through an online survey. The results will guide the development of the projected "full version" in achieving its aim of becoming a tool to encourage global partnerships engagement around the SDGs. The survey can be taken until 15 November 2015. Since early September 2015 over 80 initiatives aiming to support the newly adopted sustainable development goals were registered on the Partnerships for SDGs platform. 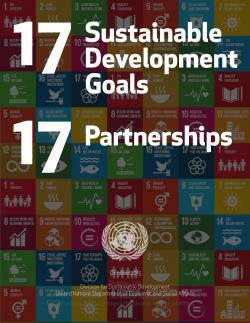 The compilation “17 Sustainable Development Goals 17 Partnerships” provides a summary of 17 initiatives – one for each of the goals. The 2030 Agenda for Sustainable Development requested the Secretary General, in consultation with Member States, to prepare a report in preparation for the 2016 meeting of the High-level Political Forum, which outlines critical milestones towards coherent, efficient and inclusive follow-up and review at the global level, for consideration of the General Assembly. In order to informally contribute to the reflection, Major Groups and other Stakeholders are invited to provide their views and inputs on these issues by completing an online questionnaire. Please note that the deadline for providing inputs is midnight on Sunday, 15 November 2015. The inputs and responses received will be made available on the Sustainable Development Knowledge Platform.